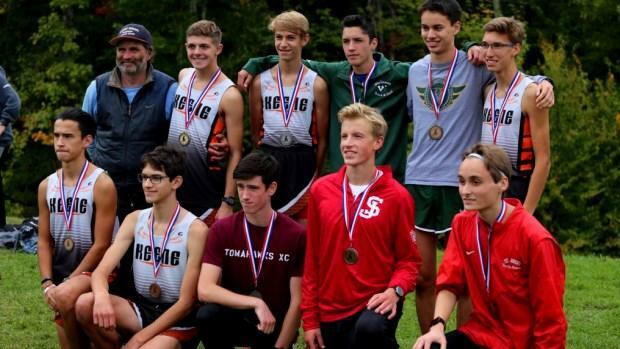 Paced by junior Jake Velazquez and Torin Kindopp, Keene High School secured the Class A team title at the 61st Wachusett Cross Country Invitational on Saturday. The victorious Blackbirds slotted their next three athletes all within the top seven finishers in a dominant showing on the undulation circuit. Velazquez, who hit the line in 16:00, successfully defended his 2017 individual championship on the Holden, MA course but unlike a year ago, the Keene contingent collectively worked from the front for the entirety of the 3.1-mile test. Kindopp, a freshman, finished in 16:17. Keene finished with 21 team points. Second place went to the host, Wachusett Regional, with 53.